This week I have been a day late with everything on this blog! So sorry guys about that. Hopefully next week I will be back on schedule. Anyways, I have been working on this piece of fanart way longer than I expected too. 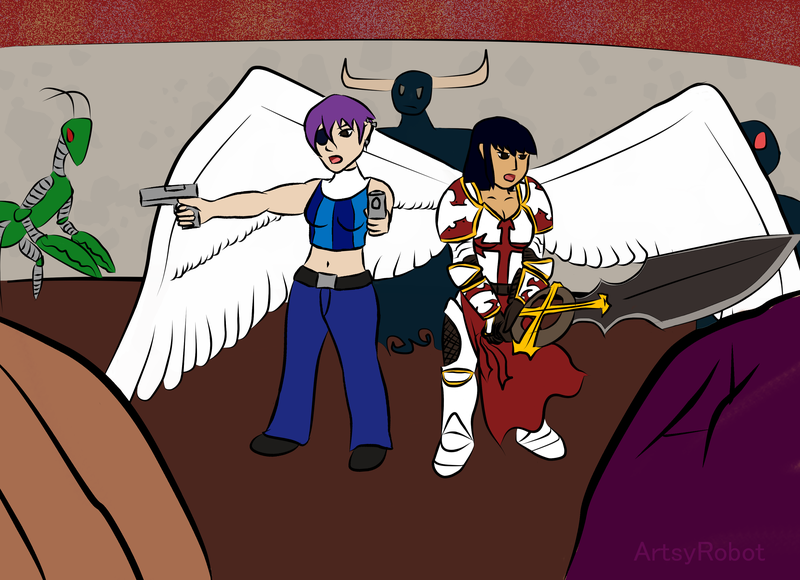 I just got Manga Studio, and had this piece of fanart I was asked to do on the Sentinels of the Multiverse forums. I decided to try drawing this piece on it. So I drew the rough draft my pencil, inked it, scanned it, then used Manga Studio to draw the outlines and color it in. Below is the end result. I would have loved it if I could have drawn more villains to surround Fanatic and Expatriette. I hope to come back to this fanart and really finish it. But I have to put this one to the side since I have so many other ideas in my head. What would you caption this piece with? What do you think the heroes in the center are saying? Comment below or e-mail me at artsyrobotz@gmail.com.